Prince George’s County has been on a four-year journey to streamline development procedures, increase certainty of outcomes, and maximize the County’s economic development potential by rewriting the Zoning Ordinance and Subdivision Regulations. The Prince George’s County Zoning Rewrite project has entered its next phase, the legislative process for adoption of a new Zoning Ordinance. 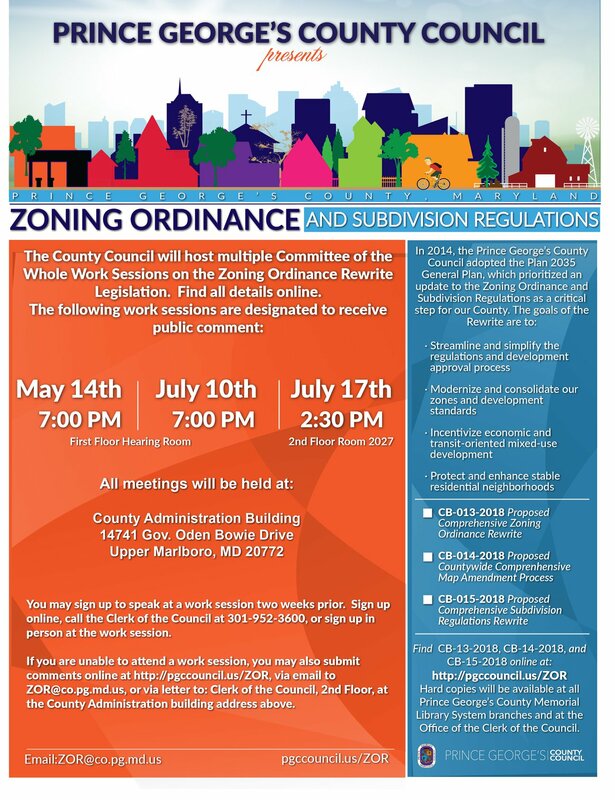 The Prince George’s County Council will host three public meetings to discuss the recent draft of the Zoning Ordinance and Subdivision Regulations. Want to stay in the know? Visit https://pgccouncil.us/ZOR for more details. We encourage you to attend this meeting to share your thoughts with your elected representatives on the draft legislation and the process to date. The legislative draft is available to download and read on the website the Council has created for this very important project – https://pgccouncil.us/ZOR (Zoning Ordinance and Subdivision Regulations) Hard copies will be available for review at each branch of the Prince George’s County Public Library. For more updates about the legislative process for the Zoning Ordinance Rewrite, visit the Prince George’s County Council’s website at http://pgccouncil.us/ZOR.